May the best man win, people here say before a contest. Fairness is important and the best man should always win, of course. But in real life, as we know, it doesn't always happen that way. In this presidential election, however, the best man did win. Which wasn't really a surprise because, despite his diminutive stature, Michael D. Higgins was head and shoulders above all the other candidates. That was recognized by the voters as the campaign went on. And he ended up getting the resounding victory he deserved. The man could talk for Ireland, people said in wonder after some of his effusive speeches. That's what the presidency is largely about. So on that level Higgins was the perfect candidate and will be an able president. But there are other levels and we'll come to that in a moment. A long time ago, shortly after I started in journalism, I used to do Mayfly fishing on the Corrib every year. In case you're not familiar with that, it's the week or two when the Mayfly hatch on the bottom of the lakes, rise to the surface and dance over the water. The trout go crazy for them so the fishing is terrific, if you hit it at the right time. The exact time varies from year to year, depending on sunshine, rain and water temperature, but it's usually in May. When we would hear the Mayfly were "up" a small group of us would drop everything in Dublin, grab the rods and the sleeping bags and head for Galway. For us, it was always to the upper end of the Corrib, to a little cottage on the edge of the lake rented by the photographer Liam Jordan from Ballinasloe. The place was quite remote, had no TV, and in the evenings we would sit around the unlit hearth chatting over a few bottles of Guinness. One evening Liam arrived back with a friend called Higgins, a young lecturer from Galway University who was a rising light in the Labor Party and had recently become a senator. That night he held the company spellbound with his passionate analysis of what was wrong not just in Ireland but in various other places around the world. It was the early seventies and the North had recently gone up in flames so there was lots to talk about. The conversation went on until it was starting to get bright outside. I remember being impressed at the time and, when I got back to Dublin a few days later, telling the newsroom to watch out for this guy Michael D. A future leader of the Labor Party, I told them. Back then, of course, we all had hair, even long hair, and we were all socialists who were going to change the world. “The Seventies will be Socialist” was the Labor slogan. We had all been part of the student revolution in the late sixties, and being left wing and anti-establishment was the norm, unless you were a hippy who had dropped out, man. Higgins was the kind of radical young lecturer we all looked up to. Since then, most of us have grown up and realized that the world is more complex than it seemed back then. We got middle aged and our politics moved to the middle -- and then even a bit to the right. Over time we learned that it's not always the establishment's fault and left wing solutions don't always work in the long run. Individual enterprise and personal responsibility are factors in making a society a success. Too much state intervention and support can produce a dependency culture that saps initiative. You can end up with a lower tier of society in which being unemployed is a choice. Crime, drugs and alcohol become major problems and families become dysfunctional. No one takes any responsibility for anything. Everything is the state's fault. Listening to the passionate outpourings from Higgins over the past few days since he became president-elect, it struck me that he still sounds very much like he did that night on the Corrib all those years ago. society, other than that his vision is still very much a left wing one. All that stuff about fostering an inclusive society, about the old values of sharing, about uniting us with new ideas and a caring, cooperative approach rather than the narrow individualism and greed of recent years. It set me to thinking about what had changed me, and to wonder why he seems not to have changed much at all over the nearly 40 years that have passed in the meantime. And the conclusion I came to is relatively simple. As a journalist over the years I have had to scrabble hard to make a living, working for various newspapers. It's the free market. You produce or you don't get paid. It always boils down to that. The better you are and the harder you work, the more you get. And it's the same in most areas in our economy and our society. In most, but not all. Higgins, for example, has lived a life in the warm embrace (and pay) of the state as a university lecturer, a politician, a minister and, in the future, will be doing so as president. Of course we need public servants and they deserve to be paid. But it's not an area that is as demanding as the private sector. The pay levels for state employees here, particularly for the jobs Higgins did as university teacher and politician, are extraordinarily high in comparison with other countries. There are long holidays, your monthly paycheck is not dependent on the company you work for making a profit, and when you retire you get a generous guaranteed pension that very few people in the private sector these days can match. All wonderful and laudable, of course, and in an ideal world we would all be this lucky. But is it possible to spend 40 years cosseted in this system without being influenced by it? Or does it mean that, without realizing it, you end up with a view of society that may be a bit naive? Higgins can talk for Ireland and he can talk 'til the cows come home. His effusive sentences form a stream that swell with emotion and flow onwards gathering momentum as they go, with no end in sight. He's an interviewer's dream. One question produces a torrent. Stopping him is the only problem. That and understanding exactly what all that flowery passionate language is saying. It's seductive, of course, and vaguely nostalgic, which is why people respond to it so well. He could talk for Ireland, they say. But does all the worthy talk make sense? Is it setting out a coherent, realistic vision? We will see. There is no doubting his sincerity. That is not in question. It's more a question of keeping a grip on ourselves and our emotions as we face into the all too real economic challenges that lie just ahead of us. For that we need a president who will set out a realistic, achievable vision without too much embellishment. Listening to Higgins speak, it always seems to me that the effusive emotion signals some unresolved inner pain. It may well be rooted in his father’s poverty and illness in Limerick in the forties which forced his parents in 1945 to send five-year-old Michael D. and his younger brother to live with his unmarried aunt and uncle on a bleak small farm in Co Clare. By the time he sat his Leaving Cert both of his parents were seriously ill and Higgins and his brother, both teenagers, had to take jobs in factories in Shannon to put food on the table. It was a tough start in life. But he was bright and education saved him. After school he got a job as a clerk in the ESB (power company) in Galway. He had also started to write poetry, and it was an admirer of his verse who gave him the money to enroll in Galway University. So it's clear that his powerful sense of social justice and his hunger for equality lies deep in his psyche and was probably developed in adolescence. There followed a stellar academic career as a lecturer in political science and sociology before he moved into politics. He has said that he wants to develop a presidency where the ideas and beliefs that led to Ireland's economic collapse will be challenged. "I have lived by ideas all my life, and one thing you can take in this presidency is that ideas will be valued," he said. But will they be the right ideas? The 70-year-old Higgins was once derided by the former Progressive Democrat leader Dessie O'Malley as likely to "go mad" if he was made minister. Well he was, and he didn't (although being minister for the arts is never too stressful). 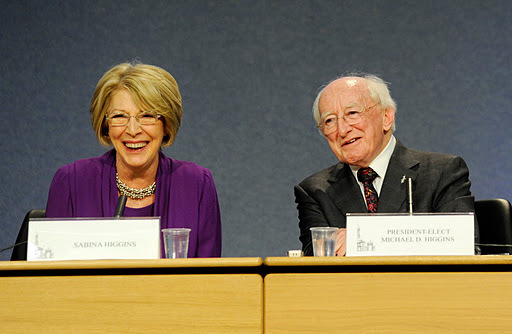 So Higgins is unlikely to go mad in the more benign role of president, even though his head is always bursting with ideas and worthy analysis. He may not go mad ... but what about the rest of us?